"Gmail™ Notifier +" is a highly customizable browser extension that notifies you about the incoming emails from all your Google-Mail accounts and labels. 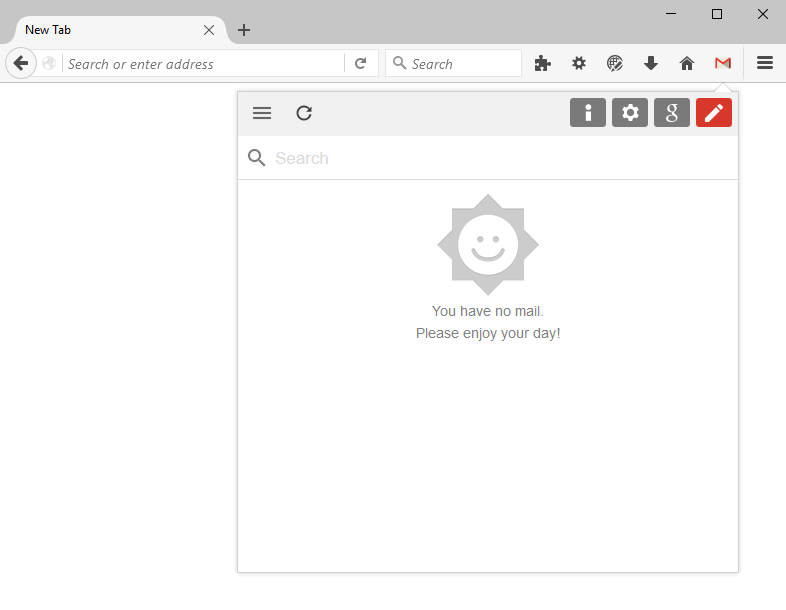 Gmail notifier is available for Firefox, and Opera. The sole purpose of this extension is to provide an easier way to access Google Mail and it is NOT THE INTENTION to mislead anyone to think this is the official extension. What is Gmail™ Notifier Plus and how does it work? Gmail™ Notifier Plus has two main building blocks. There is a background script that checks Gmail's feed frequently to notify you about the number of unread emails you have in all your logged-in accounts. The script uses Gmail's RSS feeds to retrieve the number of unread emails for each account and hence it is very fast and efficient. The second building block of Gmail™ Notifier Plus is the panel user interface which allows users to check there emails directory from browser's toolbar. The toolbar panel is actually the original Gmail interface on mobile devices and hence it is very fast and lightweight compared to the desktop version. The interface allows you to read your emails, reply to senders, mark messages as read, report spams and even tag your emails. Is it possible to change the time interval the Gmail™ Notifier Plus uses to check for new emails? Yes, just head to the settings page and adjust the time interval there. Is it possible to ask Gmail™ Notifier Plus to check other labels than the default "inbox" label? Yes, Gmail™ Notifier Plus accepts label check in the settings page. You can have as many labels as you would like. Just enter the labels in the feed box and on the next check you will get notified of the all requested labels. Some of my Gmail labels have space in them. Gmail™ Notifier Plus does not seem to recognize them. Is there any workaround for this? Just replace all the spaces with "-". Note that all labels need to be in lower-case. How can I enable the "Panel View" in Google Chrome? To Enable Panel View Type "chrome://flags" in the addressbar then Press Enter in the Flag's page Search for "Panels" and Click on "Enable" then Restart Chrome. You should see Panel view if you click on the Gmail icon. Can I open the full Gmail UI from the toolbar panel? Yes, there is a button in the panel's UI. You can hit the button to open Gmail interface in a new borwser tab. Is it possible to change Gmail's settings from the toolbar panel? Yes, there is a setting button in the mail panel. Hit the button to direct to the settings page. Depends on your browser, there are different ways to access the settings page. For instance in Chrome and Opera, you can access the settings page, by right clicking on the toolbar icon. However, the recommended way is to press the settings button in the toolbar panel UI. A question from a user: Since you must be logged into Gmail for this notifier to work, doesn't that open up your email for potential "hacking incidences"? Well, Gmail™ Notifier Plus does not accept user credential storage exactly to prevent this sort of leakage. Note that there is no real good solution on storing passwords by an add-on which is safer than what browser does itself. So there is no good explanation on saving credentials security-wise. Also by letting the add-on use browser session, you can always logout from Gmail or ask browser not to store passwords for your Google account. What is the meaning of "Moved Temporarily. The document has moved here" and how can I fix this? It means for some reason the extension stored a wrong URL for accessing mobile version of Gmail website. You need to reset extension's preferences to fix the issue. In Chrome, simply remove the extension and re-install it from the store. In Firefox, open "about:config" page in a new browser tab and search for extensions.jid1-sqmEAwSoa3FZPc@jetpack.gmail-url. Save the current value and then right click over the preference and press the reset item. Please email me the value before resetting (or add the value in the comments section of this page) so that I can fix the problem for next releases.